I see the topic of no-spend challenges brought up repeatedly in the PF blogosphere – and I always dismiss them as not being for me. I feel we have a no-spend lifestyle! We don’t have a classic “latte factor” – a daily drip of single “want” purchases that add up substantially – and I think that undertaking spending fasts would only result in spending binges because we would delay necessary spending. 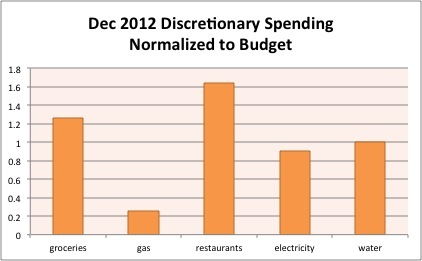 Different people have different opinions on what counts as spending in a no-spend challenge, but for the purpose of tracking and reforming spending, the only types of transactions that matter are ones initiated by the challenger that are discretionary purchases, not utility bills and the like. For us, it’s easy to differentiate discretionary and not because all of our bills are auto-drafted on various days throughout the month, not written as checks or even manually initiated online. The results are that of 31 days we made purchases on 11 days, drafted external transactions on 12 days, and made internal transactions on 14 days. So for a typical no-spend challenge, we would have had 20 of 31 days qualify as “no spending.” I think that’s pretty high, especially without trying to reduce the number of purchases or group them together! I’m glad I put this data together visually because I can see our spending patterns, which I found a bit interesting. We spend money every weekend on groceries and also tend to run errands on Friday through Sunday (getting gas, going to the hardware store). Our spending on Monday through Thursday is really quite minimal – I can name all of the purchases we made on those days in January off the top of my head: buying the lift tickets for our ski daytrip, buying a mini cheesecake from our friend’s new baking business, and dining out for Restaurant Week. 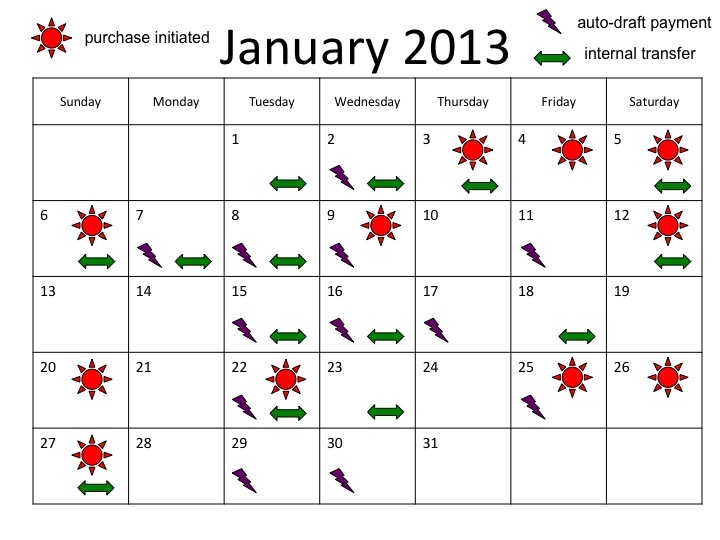 All of those were one-off events, too, not part of weekly patterns. Our “latte factor” is more likely to be services we use all the time but pay infrequently like insurance. This is the reason that we reduced our rent by moving last August and will continue to focus on reducing our fixed living expenses instead of being concerned about our purchasing habits. Do you undertake no-spend challenges? If you plotted all of your transactions like I did, how would they compare? What’s your latte factor? How Do You Decide How Much to Spend on Groceries? 50 Responses to "Why We Don’t Do No-Spend Challenges"
I know exactly what you mean with no spend challenges just not seeming relevant to you! I “spend” on pay day (transferring to savings, mortgage etc) and when I do my grocery shopping once a week, but other than that, isn’t every day a no spend day?? Even when I need to buy clothes or gifts, I tend to wait until I absolutely can’t put it off anymore which means I wind up having to buy everything at once. I’m not saying I actually spend less by doing that – just that I’m spending it all on one day. I do the same thing with clothes shopping – and good point about grouping purchases vs. spreading them out being all the same. That said my BF is the opposite and could definitely benefit from some no spend days. Not sure that’s ever going to fly though. Isn’t that always how it goes? Those who need the behavior change are averse to taking the challenge. A no-lunch challenge seems like a great one – very specific. And it’s great that you have identified who should do the grocery shopping! Why would you count insurance as a “latte factor”? If you have a car, it’s not discretionary, it’s legally required. That touches a little bit on why I don’t do no-spend challenges, though – a lot of my spending is stuff that kind of skirts the line between “need” and “want,” and when I do try to avoid purchases like that, I just end up putting it off for a few weeks or months rather than avoiding it all together. I’m talking about things like replacing worn out running shoes – I run about 30 miles a week, so when they wear out I get really bad blisters, but the fact that exercise keeps me healthy doesn’t mean that I *need* them. And then a decent amount of it is stuff that is actually discretionary, but would seriously impact my quality of life, like traveling to visit my husband when I’m doing months of fieldwork. Even though we need insurance, we should still look for ways to save money on the payments – like the rent example. We have to live somewhere but we found a better deal. With insurance you could decide that you are over-insured and cut back, or raise your deductible, or change companies for a better deal. I agree the no-spend challenge would be best undertaken with a targeted undesired spending category in mind. It’s hard to decide when to replace things that are wearing out – I put off buying clothes as well, but I’d be really careful with running shoes! I’m with you, I’ve never done a no-spend challenge, simply because for us, they would likely just be deferring spending to a later day, in which case the effort results in zero net gain. When other bloggers propose a no-spend challenge it is always at a really bad time for us, like spanning a move or a vacation! So I’ve never even attempted one. If I tried to chart my “spending” like that, I’m sure I would find it completely random. We don’t have much regular spending. Heck, very little in my life seems to be regular. Especially over the longer term. In the month of January, I had to buy gas (including for the U-Haul) 6 times, December was 3 times, and November was only once. Yeah it does seem like things are changing every month for you guys – that is really hard on a budget. You should start your own no-spend challenge when you need it most! Here’s us on the topic: http://nicoleandmaggie.wordpress.com/2011/08/29/what-do-you-think-about-no-spend-days/. Plus whenever I think about a no-spend challenge it makes me think about buying things. Same reason I’m no good with cash, but don’t spend much with the credit card– I seem to be less likely to buy if I have the *option* of infinite buying. I’m happier too. Our today’s post is about a monthly spending challenge and of course I just had to check my amazon wishlist and noticed that a $111 book that I will buy eventually was marked down to $31… and I bought it. Something I would not normally do. nicoleandmaggie recently posted..February Mortgage Update and a Minty Fresh February Challenge: Is it worthwhile? I can see how you would think about spending more in a challenge! And that sounds like a great deal on the textbook. I attempted a no spend personal challenge and failed miserably. I needed to curtail my spending on fast food. It is wasteful and addictive and so darn easy after a long day at work. I failed my own challenge by rebelling against the tight budget I had set for myself. I waste too much on fast food. Instead of eliminating it I have given myself a small weekly budget for it because total denial is just too hard and McDonald’s french fries are just too good. I discussed that issue of cold turkey vs. tightly controlled amounts in an earlier post and I’m just the opposite of you – I prefer cold turkey as continuing the behavior at a lower level just perpetuates my addiction! I love this! I agree about no-spend challenges, although I’ve taken part in them in the past. I use them more for a reason to do a deeper analysis of my spending habits (I track my spending to the penny and have done so for over 5 years). I really like your visual here, too. I’m definitely a visual learner, and I’ll have to look into some options that are similar to this. The Happy Homeowner recently posted..Creative Valentine’s Day Gifts on a Budget….and a Giveaway! Thanks! I don’t automatically generate any visuals of our financials, just whatever Mint does, but sometimes I do it manually. Tracking is good but we don’t always take it to the next level of analysis, so if a no-spend challenge does that for you, great! I’m not against these kind of challenges but what I prefer to do is follow what has worked so well for me over the years. Instead I have focused on a really great savings plan by focusing on the other end of the stick per say. When it comes down to I’ve managed to cut my spending but only because I have the goal to save more money and spend less but if you don’t actually save that money is it really worth it. Very smart approach – we have done the same at times. I don’t really do no spend challenges either. I don’t find that helps me at all. No spend challenges seem like more of a reactive response to a problem than a reactive one to me. Like if I want to cut down on grocery spending, the way to do that isn’t to reduce the number of days I go to the grocery store, but keep a shopping list and a price book. A proactive way to cutting down on eating out is to meal plan or to keep more staples in the kitchen pantry. If I want to cut down on buying books, I need to find a way to make getting library books easier. There are plenty more examples like that too. Maybe a no-spend challenge could be a catapult to the more targeted strategies you outlined…? It doesn’t automatically let you know what your spending issue is, though, unless it’s just that every time you enter a retailer you overbuy. We don’t do no spend challenges either. Since we have kids, it would be almost impossible to implement! We always end up needing something for them! Sounds like your kids need to undergo a no-spend challenge! Kidding…? I definitely don’t take part in these challenges either – impulse purchases aside, you are just transferring expenses to another day! Why not do a no-coffee challenge or something similar instead?! Well, a no-spending challenge would definitely include buying coffee, and I don’t think many people who brew at home are inclined to reexamine their addictions. My “latte factor” is probably books. I have boxes and boxes of them and I’m considering building more bookshelves just to house them. I almost never buy them new and save a fair amount of money that way at least. I don’t do the no-spend challenges either, everything we spend is agreed on or budgeted in advance so I don’t know what it would really change. Do you still by physical books and how does the price of new books compare to that of eBooks? I looooove books and haven’t bought an eReader yet, but I use the library because I can’t let our spending match my appetite. Why do you like owning them? If I ever read one I want to lend I’ll buy it. The only time I buy ebooks is when I’m on vacation and the local stores are either hard to find or super expensive. Otherwise I greatly prefer the paper versions, partly just for the nostalgia and partly because I don’t like not being able to freely lend out the virtual versions. I also tend to write my thoughts in the margins. I usually don’t buy new books though, I mostly buy used whether at used book shops or more often Amazon used or Half.com. Sometimes the books themselves are practically free (under a dollar) and shipping is usually around $2-$4. Oops, I meant to type ‘used’ not ‘new’! Good to know the price, thanks. Forgot to mention, I also use the library fairly often as well. I probably only buy around 1 book per month so the $5-10 isn’t really a huge expense. Not much of a latte factor, then! I think DB’s original conception of it was $10/day. Hmmm… Guess I don’t really have one then. In college it was Qdoba though, I lived about 2 blocks away from one and would probably go every other day. Basically every weekday is a no spend day for me. I really don’t buy anything during the workweek unless there’s some sort of emergency. All of my grocery shopping and other shopping happens on the weekends. I bring my lunch to work, don’t drink or buy coffee, and don’t typically go out after work expect for maybe once or twice a month with girlfriends (typically on a friday). Sounds just like how we live! It’s a quiet life and I like it. From what I’ve seen, most (but perhaps not all) of these no-spending days or weeks are basically smoke and mirrors in my opinion. They always seem like an attempt to feel good about things by moving the purchase days around a little and then focusing on the good days. If your long-term consumption rate doesn’t change, then nothing really happened. Spending $100/week on groceries is the same as spending $200 every two weeks and declaring no-spending victory on the alternate weeks. Same goes for gasoline, maintenance, and all the other games I see played. Sorry to be so cynical. Maybe there are some realistic efforts that I haven’t seen. I don’t think you’re being too cynical at all – unfortunately. So nice to read this! I don’t do no-spend challenges either as I am very frugal and only buy non-necessities probably once a week (entertainment budget) or if I have guests. I love how you compiled the data! I would say I probably have 15-20 no-spend days. That’s very solid and similar to us! I don’t do them either for that exact reason you said about it making you want more and then you end up spending like crazy. I don’t want that kind of restrictive lifestyle. But I do try to implement conscious spending more. I really think about each purchase with more thought and clarity. Even as something as simple as a new bath rug, which I’ve been thinking about. I think about why I think I need one, and the truth is I don’t really. I can just clean up the one I have now to make it pretty again. So I think for me it’s identifying those triggers. I like the suggestion of writing down purchases like those and sitting on them for a while. You’ll either show yourself that you can live with what you have or decide that it’s really worth the money after the deliberation time. I have never done no spending days challenge. I never got it completely, it looked it money was just moved around. We do buy frivolous stuff but I would buy that anyway even if I postpone it by a day or a week because generally we don’t buy anything immediately anyways. By the time we decide to buy something we have already deliberated on it for a couple of weeks. Our clothes expenses are extremely low as I buy a lot of clothes when I go to India and in the years I don’t go back, we buy clothes once or twice a year as something else wears out. Suba recently posted..Luck and logic : How to make your own luck? Yeah, if you’re not making the purchases immediately a no-spend challenge wouldn’t have much effect!